So finally, amidst all those cricketing action & tiring days this month finally comes to an end. As promised in the Top Commentators Award post, we will be giving away two 125*125 Banner Slots to the two commentators who left everybody behind and grabbed the opportunity to advertise their site on DailyBlogging. Mind you we are giving away do follow links, so you’ll get a fair backlink from us. And this backlink will be very useful for increasing the PR of your blog/site. 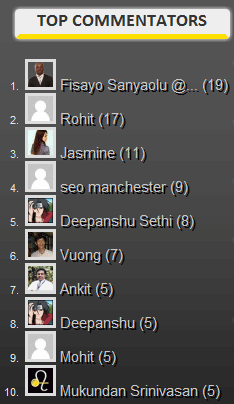 Without further ado, the winners of the Top Commentators Award for March 2011 are Fisayo and Rohit. Congratulations to both of them from our side & hope they get some visitors to their site from here throughout the month. The image below is taken by me from the cache’s because I couldn’t access my PC on 31st evening/night. So the comment count isn’t exact, but the winners remain the same. Both, Fisayo & Rohit have been contacted & I’ve received Rohit’s 125*125 Banner image. I hope Fisayo sends his banner image soon. I would like to wish ‘All The Best’ to all the commentators who will be a part of this month’s i.e. April’s Top Commentators Award. Thank you for keeping DailyBlogging alive & active with your lovely discussions & point of views. I wish to be on the list this month. Thanks Mani, I send it soon. Congratulations to the top commentators. Wish to build a little more exposure through the banner. And thanks for making it do-follow. Congrats to the winners! Thanks for having the contest Mani. Congrats to the winners. What, I am not one of them? Doesn’t matter, let’s try next month… err, I mean this month! Congo to the winners, well mani you have inspired me to do a similar type of contest at my blog. Congratulation for the winner!! Hi Mani you have inspired me to do the similar type. ps – mani hav u upgraded to 3.1.1 ?